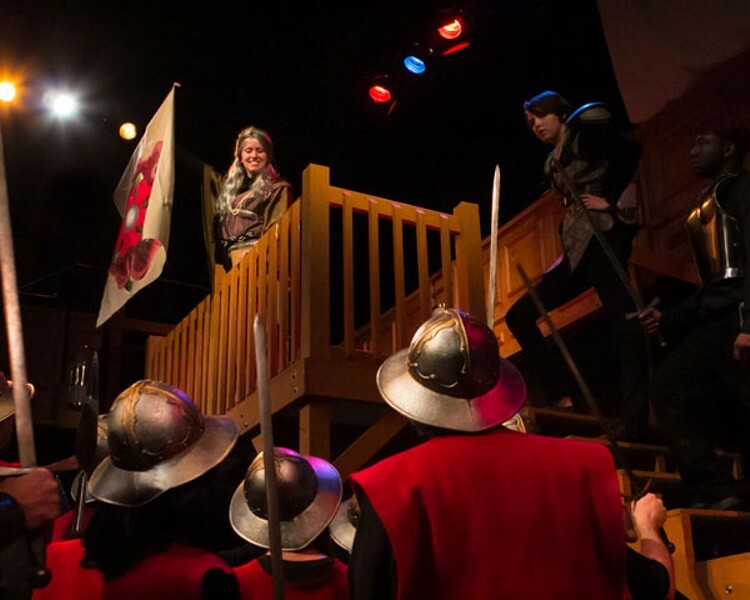 The title character in Queen Margaret, played by Katie Bearden, looks down upon the troops. How does a chaste medieval damsel become such a bloodthirsty terror that the Duke of York, claimant to the English throne, calls her the "She-wolf of France" — with a "tiger's heart wrapped in a woman's hide" — moments before he succumbs to her blade? Queen Margaret, the new Shakespearean concoction at Spirit Square, holds the answers. Culled by director/lighting designer/fight choreographer/actor Tony Wright from the Bard's Henry VI trilogy, the new adaptation condenses 15 acts, 76 scenes and more than 8,600 lines into a remarkably coherent story that clocks in at around 2:20 plus intermission. By switching focus and title characters, we need not begin when Margaret's future husband, Henry VI, snuggles into the throne at the age of nine months. Nor must we bother with any of the warfare between England and France — or that pesky Joan of Arc. No, the Maid of Orleans is already in custody in Act 5 of Henry VI, Part 1, when we first bump into Margaret of Anjou as a prisoner of The Earl of Suffolk, the plum role Wright plucks for himself. Suffolk would like to pluck Margaret for himself, but the French maiden is the daughter of the titular king of Naples, above his station and — he almost forgets! — he's already married. So he woos Margaret on behalf of Henry, convinces him of her beauty and worth, and soon after their marriage, Henry throws off the protectorship of his Uncle Humphrey (the Duke of Gloucester) and fully assumes the throne. If he plays his hand correctly, Suffolk will have preferred access to the ear of the king and the bedroom of the queen. Yet because Henry is so godly, cautious and frail, Margaret cannot merely sit decoratively on her throne or lounge in her boudoir. She must play her cards boldly as palace intrigue, motherhood, her husband's weakness and the brutalities of the War of the Roses shape her into the merciless predator she becomes. Margaret, rather than Henry, is the inspirational leader who mounts the battlements near Tewkesbury, waving the proud flag of the Lancasters and urging the lords, knights and gentlemen into battle to reclaim the palace and the throne. Or she would be if Shakespeare Carolina, in producing this worthwhile premiere, had a budget. Nothing at Duke Energy Theatre even distantly resembles a palace or a throne. James Burns Jr.'s set, a lumbering stairway to the balcony level of the Duke with a landing near the top, is more a construct than a design. Costumes by Rebecca Randolph, a curious mélange in which shoulder pads are as likely to be worn into battle as armor, fail a fundamental criterion. In a battle between the Yorks, symbolized by the white rose, and the Lancasters, symbolized by the red, soldiers pairing off in mortal combat shouldn't be wearing identical red costumes. The budget must always be bigger than that. And if David Hensley has taken the time to create projections that fill up the gaps in Wright's history, care must be taken that all the words are centered on the screen before the performance begins. If Shakespeare Carolina's fundraising efforts had been more successful — or if they could simply knock on a single door in Charlotte and have access to a local company's cache of costumes — the action might look as smart as the acting. Wright's fight choreography is commendably varied and well-executed, and his performances as Suffolk and, later on, as Lord Clifford, Margaret's staunchest supporter once the civil war begins, combine the best qualities of his recent performances. Yes, you'll find the action-hero charisma that Wright flashed last summer in the title role of Zastrozzi paired with the sleaziness he oozed in August: Osage County as a philandering fiancé. And Wright's project reminds us how magnificent a character can be when molded with the messy clay of truth — as it must be, to Margaret's great advantage, in a history play. Within the wide arc of her grim maturation, Katie Bearden must switch from cruel, merciless conqueror to pitiable mourner and supplicant as the queen, with a stirring rallying cry in-between. Bearden spans these big Henry VI, Part 3 moments vivaciously, but there are stretches during the evening where she will noticeably mute her voice, as if to conserve her energies for the oracular moments to come. Now that the rigors of rehearsal are over, I expect she'll be more consistently powerful in the second week of her reign. There are numerous other performances to commend, including a couple of gender benders. Deprived of the sinew and complexity that Act 5, Scene 5 of Part 1 might have added to the king's character — he was betrothed to another before Suffolk swayed him toward Margaret — Nathan Kelly Rouse is convincingly milksoppish as Henry, only fitfully equipped with a backbone. With his booming voice, Russell Rowe provides a telling contrast as the Lord Protector, Humphrey and Amy Arpan begins as his arrogant, meddlesome wife Dame Eleanor before resurfacing after intermission as the misshapen son of York, the future Richard III, already carnivorous as a lad. George Cole ably wears the paper crown as the Duke of York at the height of Margaret's villainy, and after an eerie portrayal of a crazed murderer, Nathan Morris is most memorable as the Duke's valorous elder son, who becomes Edward IV before this is all over. The Edward who doesn't quite ascend to the throne is Margaret's son, and Wright audaciously casts Arrietta van de Voort as the Prince, providing her with the opportunity for an auspicious debut. There isn't much comedy here, but Chris Freeman comes closest as the side-switching Earl of Warwick. When Richard III is performed, it is invariably trimmed of references to the Henry trilogy that precedes it. I suspect we hardly ever see those works because of Shakespeare's corrosive depiction of the canonized St. Joan. So we can be thankful to Shakespeare Carolina and Tony Wright for at last performing a similar surgery on the treasurable trilogy. The enchanting, spirited queen who emerges is well worth remembering.